I hadn’t had crème brûlée for years when I came upon it on a restaurant menu last week. Interestingly, rather than serve the classic French dessert in a ramekin, the pastry chef opted for a rather inimitable presentation. The crème brûlée custard was cut into cubes, arranged on a plate, and then caramelized. A variety of fruity sauces and shredded pieces of cake adorned the dish. The clever presentation inspired this blog post. Looking for a unique way to serve crème brûlée, and on the heels of the banana cream tart I posted about last week, I began contemplating the possibility of baking the custard in a tart shell. I came across a few recipes online, but eventually settled on modifying this one from Michael McCarty. I worked with my own tart dough recipe (indeed, I do have a rather lengthy tutorial on perfecting shortcrust pastry), but used McCarty’s recipe for the filling. Unlike the pastry recipe that I used for last week’s banana cream tart, which delivered a much-needed crunch, this tart shell has the soft, flaky texture of a pie crust. The buttery base complements the creamy custard and crunchy caramelized sugar topping far better than a harder tart shell would. This dessert is surprisingly easy to prepare, akin in method to preparing an apple pie but a tad less time consuming since no apples need to be peeled, cored, and sliced. One can substitute the figs for any soft fruit or even skip a fruit topping entirely. Next time, I will experiment with raspberries and halved blackberries meticulously arranged on top. The recipe I share below is almost identical to the one I used, except for one modification. 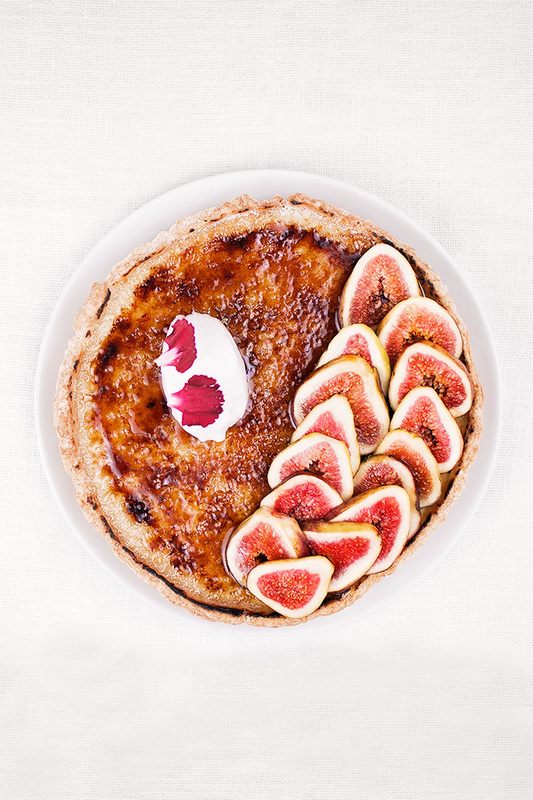 In the tart pictured, I brushed the sliced figs with a neutral glaze to make them shine. I often coat fruit with a neutral glaze since it adds a wow-factor. My devil’s food cake, for example, would not be nearly as stunning without the glistening berries that adorn it. However, in this case, a neutral glaze (which has a high moisture content) would eventually dissolve the crunchy burnt-sugar crust. If you need the tart to last for more than a few hours, I would suggest skipping the neutral glaze. Otherwise, you can find the recipe (which only requires water, sugar, lemon juice, and pectin) within my recipe for devil’s food cake. This tart is one of the most amazing desserts I’ve had in months. 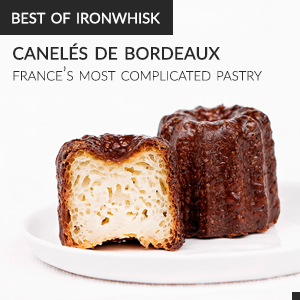 I highly recommend baking one, not only for its wonderful taste but also for its stunning appearance and relative lack of complexity. There is simply nothing like buttery, flaky pastry topped with custard and crackly, caramelized sugar. A crème brûlée tart with flaky pastry, creamy custard, and crunchy toasted sugar. Note that I have slightly simplified the tart dough recipe here from the method I describe in my tutorial for perfect shortcrust pastry. Combine the flour, sugar, and salt in a large bowl. Add in the diced butter and cut in with a fork until you are left with pea-sized pieces of butter. Alternatively, use a food processor. Add in one tablespoon of ice water at a time, lightly incorporating it with a fork, until dough holds together. Do not overwork the dough. Do not add too much water. Bring the dough into a ball, flatten into a disk, cover with plastic wrap, and let chill in the fridge for at least 30 minutes and up to a week. Combine the cream and milk in a medium saucepan. Scrape the vanilla bean into the milk mixture and add in the whole vanilla bean. Bring to a simmer over medium-high heat, cover, remove from heat, and let steep for 30 minutes. Meanwhile, whisk together egg yolks, egg, sugar, and salt in a bowl. Whisk the egg yolk mixture into the steeped milk. Strain into a measuring cup that you can use to pour the filling into the tart shells. Roll out the dough on a floured work surface and cover the tart pan of your choosing with the dough. This recipe made 4 3’’ diameter round tarts as well as one large 8’’ tart, but of course you can just make one large tart or many smaller ones. Put the tart pans in the freezer to chill for at least 30 minutes. Prick the bottom of the tart dough with a fork a few times (this helps prevent the dough from rising). Cover the top of the dough completely with tinfoil. Add pie weights or beans on top of the tinfoil (again, this helps prevent the dough from rising). Bake for 15 minutes. Remove the tinfoil with the pie weights/beans and bake for an additional 20 minutes, or until golden. Leave tarts in the tart pans. Pour the crème brûlée filling into the tart shells. Bake at 300°F (150°C) for 25-30 minutes, or until the filling jiggles slightly when the tart pan is disturbed. Cool at room temperature. Remove from tart pan (unless you plan to serve the tart in the pan). Place in the fridge until cold/overnight. Remove tarts from fridge and sprinkle a generous layer of sugar over the crème brûlée center. Caramelize with a blow torch. Alternatively, use the broiler setting of your oven but be sure to cover the edges of the tart with tinfoil so they do not burn. Let stand at room temperature for at least five minutes to allow sugar to harden. Then, decorate with figs, toasted meringue, and edible flowers.